As with the last few weeks, I'm looking at some of the old comic book scripts I found floating around in my archives. This week, I've got the scripts for Fantastic Four #47-#49 circa 2001. 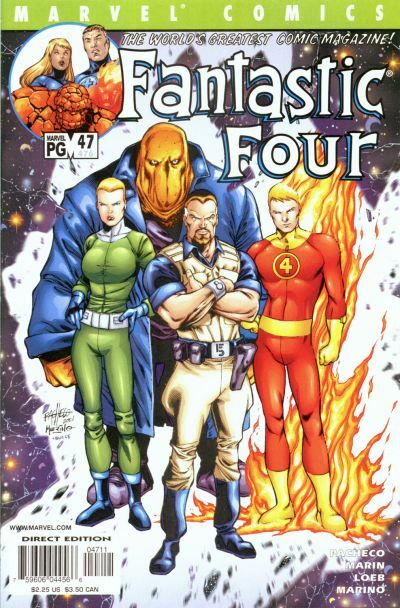 These three issues, after a sort of prologue in the 2001 Annual and FF #46, comprise the story of a villain called Abraxas. He was essentially created with the death of Galactus in the Annual, and went about trying to cause chaos throughout a bunch of different realities. The Fantastic Four, needless to say, were trying to stop him. As far as I've been able to tell, Abraxas hasn't reappeared since FF #49. In this instance, the scripts, by Carlos Pacheco and Rafael Marín, are pretty close to what you see in the published books. These were what were used by the artist (Pacheco for #47 and #49, Jeff Johnson for #48) to draw the story. When he originally shared these with me, Marín did note, though, that "as an artist, Carlos is always including some last [minute] changes." Jeph Loeb was brought in to write the final dialogue afterwards.